Table 1. 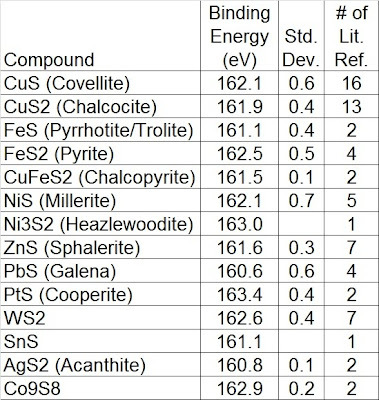 S 2p3/2 binding energies compiled from the NIST database  and other sources. Notes: 2p3/2 - 2p1/2 doublet separation = 1.18eV, peaks constrained to a 2:1 area ratio (2p3/2 : 2p1/2), generally one sets both peaks to an equal FWHM for ease of use although in pure samples this may not be the case. Smart et al. and Pratt et al. 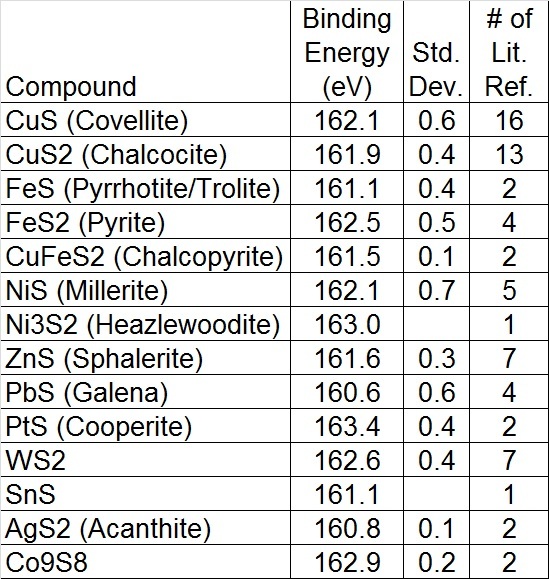 give an excellent overview of binding energy ranges for the study of mineral surfaces. 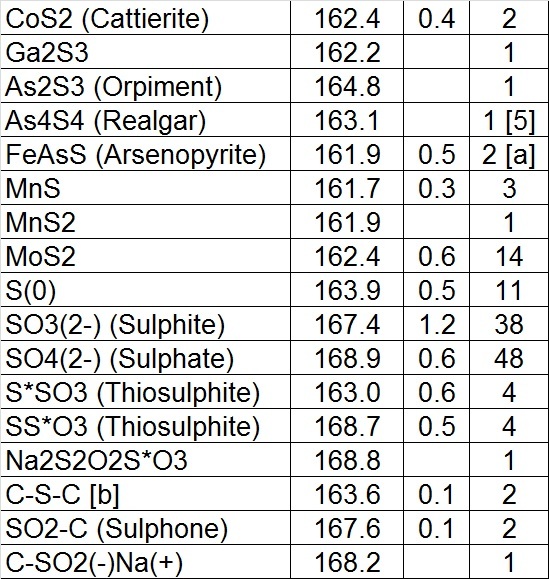 These ranges can be used with other sulphur containing systems as well. Of particular interest is the assignment for polysulphides eg. (S4)2- = 162.0-163.0 eV, (S5)2- = 161.9 - 163.2 eV, (Sx)2-) = 163.7 eV. Surface species can also play a role in XPS, especially for in-situ fractured sulphide mineral species . [a] Nesbitt et al. give a value of 162.2 eV for the disulphide in arsenopyrite. [b] A more detailed look at organic sulphur species can be found here. 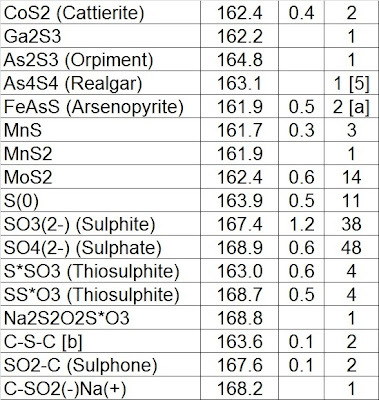 A Na2S2O3.5H2O (sodium thiosulphite cooled to -130C during analysis) reference sample gave S 2p3/2 peak positions of 162.1 eV and 168.1 eV for S*SO3 and SS*O3 moieties, respectively. R.St.C. Smart, W.M. Skinner and A.R. Gerson, Surface and Interface Analysis, 28, 101-105, 1999. A.R. Pratt, I.J. Muir and H.W. Nesbitt, Geochimica et Cosmochimica Acta, 58 (2), 827-841, 1994. H.W. Nesbitt, M. Scaini, H. Hochst, G.M. Bancroft, A.G. Schaufuss and R. Szargan, American Mineralogist, 85, 850-857, 2000. A.R. Pratt, H.W. Nesbitt, American Mineralogist, 85, 619-622, 2000. H.W. Nesbitt, I.J. Muir, A.R. Pratt, Geochimica et Cosmochimica Acta, 59 (9), 1773-1786, 1995.